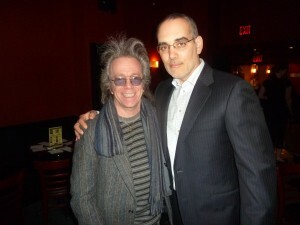 Jeffrey Gurian of Comedy Matters TV with Chris Mazzilli of Gotham Comedy Club at the Laugh For Sight charity event, one of the many charity events that Chris holds throughout the year! I managed to dance anyway, but missed my chance to dance with Marina Franklin, who was occupied dancing with someone else! Some of the people there were Jordan Rock, who came with his Mom, Rose Rock, the matriarch of the Rock comedy dynasty, featuring brothers Chris, Tony, and now young Jordan, who was just 21. 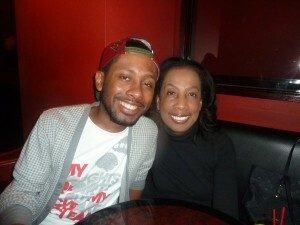 Jordan Rock with his young-looking Mom Rose, the matriarch of the Rock comedy clan, that spawned Chris, Tony, and now Jordan! And no surprise, she has a great sense of humor! 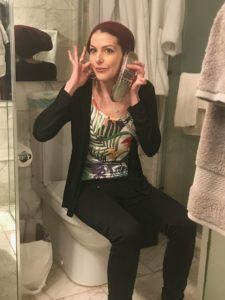 I also saw Todd Barry, Ted Alexandro, Mike Yard, Carmen Lynch, Helen Hong, or was it Herren Hong, (both of whom are moving to LA very shortly), Angelo Lozada, Dan Naturman, Kyle Grooms, Greer Barnes, Yonah Grossman who runs the open mics with Jessica Kirson, Marion Grodin, Madison Malloy, Andrew Schwartztol, Jordan Ferber, Jamie Rosen, Mike Vecchione, and so many more that it was probably a silly idea for me to try and name them since I probably left out hundreds of people I was talking to. 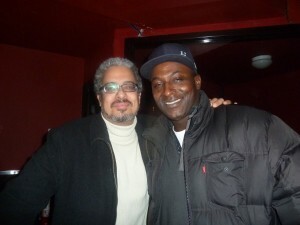 “Brothas” in comedy Angelo Lozada and Mike Yard jus’ chillin’ at the Gotham Comedy Holiday party! The people from The Syndicate, Matt Kleinschmidt, Chris Elles, and Tracey Zucatti, were there too, which was very cool, since it’s always nice to meet people in person who you talk to online. The Syndicate reps some very heavy hitters. When I left by around 10:30 to host the Monday night show at The Comic Strip, the party was still going strong! Good job Chris and Steve, … as always!!! 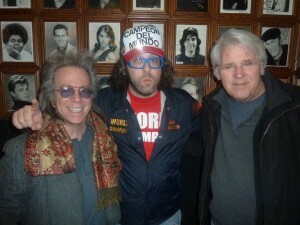 New Issue of Comedy Matters-2/14/11-Judah Friedlander, Nick Kroll, Amy Schumer, Rachel Feinstein & Many More! 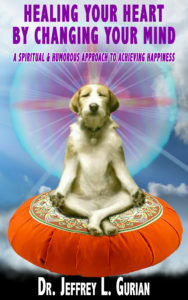 The Key of Awesome ( www.thekeyofawesome.com ) makes comedy video parodies. Their Kesha parody of her hit song Tik Tok got 63,000,000 views ( that’s not a typo!) and still rising. Their Lady Gaga video parodies get around 20 million hits plus and the star of those videos is Lauren Francesca, who has gotten over 150 million hits on all of her videos combined. This numbers are staggering, when you think that most comics would be thrilled with 100,000 hits on something they posted. The Key of Awesome’s main players are founders Ben Relles, director Tom Small, and writer/performer Mark Douglas. You have to see Mark as Lord Gaga. The man is brilliant! So why am I telling you all this? Because The Comic Strip will be the site for the presentation of the new video I created for the launch of Lauren Francesca’s new channel, which launched on Valentine’s Day. Jeffrey and Lauren Francesca as Besame Mucho, wearing color-coordinated outfits, on the set of “The Academy of Oral Skills." She runs a kissing school for women, who need to improve their oral skills. It’s called “The Academy of Oral Skills” and she runs a tough class where she teaches women rare oral exercises like tongue push-ups, trapeze swinging by your tongue, and other assorted skills. The problem is that when You Tube saw “Oral Skills” they flagged it as possibly being too sexual when there’s nothing in it but kissing! Mark Douglas from The Key of Awesome being pinned to a wall by an oral student’s tongue. Several nights a week you can find World Champion of everything, Judah Friedlander, hanging out at The Strip, waiting to do a spot. Not that he has to wait. He could go on whenever he wants but he enjoys the hang. Judah came in recently in the afternoon to do an interview for the book I’m doing with Richie Tienken, owner and founder of The Strip, for the 35th anniversary of the club. We also filmed it for the Vook we’re planning, which is a video book, something very new. 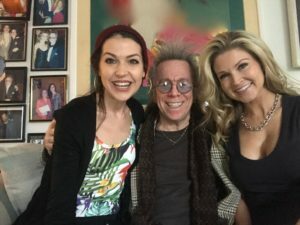 We had the best time, because Judah just kicked back and told us great stories of how he got started, how it was a goal of his to pass and perform at The Strip, how he got 30 Rock, and lots of other cool things. What’s great about Judah is that he hasn’t let success get in the way of being a nice guy. He’s approachable. He’s very kind to his fans who mob him after the show, and he’s very humble and grateful for his success. I like the bit he does when he’s running on his treadmill that has hurdles on it while he’s shoulder pressing heavy weights. His new book is “ How To Beat Up Anybody” and if you don’t run out and get it, he will definitely find you, and beat you to a pulp! 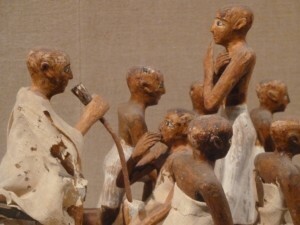 Also, many of you may not know that Richie Tienken is a comedy historian and through his exhaustive research he came up with the very first stand-up comedian from ancient Egyptian times, which he donated to the Metropolitan Museum of Art. This is a photo of the very first comedy cruise, captured in a sculpture and donated to the museum by Richie Tienken. Ancient comedian sculpture, donated by Richie Tienken to the Metropolitan Museum of Art, Antiquities Section. Starting with their fabulous holiday party in January, Gotham has had a string of unbelievable shows one after the other. 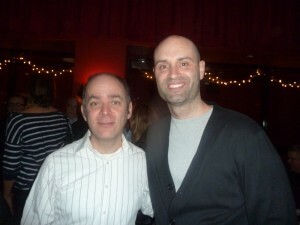 The holiday party was a smash, and packed with comedy notables, like Ted Alexandro, Mike Vecchione, Todd Barry, Judah Friedlander, and John Fugelsang, who was back in New York from Florida, getting over the loss of his Dad. Our sincerest condolences to John. He’s back making waves in the biz. Bonnie McFarlane, Amy Schumer, and Rachel Feinstein at the Gotham party. Rich Francese said he wouldn’t mind being a rapper, cause there doesn’t seem to be any weight limit! He got invited to a birthday party on the internet so he sent them a picture of a gift! 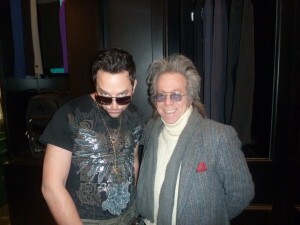 (L-R) Harris Stanton and Dean Edwards at Gotham. Anthony and Royale call themselves The Goodtime Brothers and it fits. Everyone there has a good time. 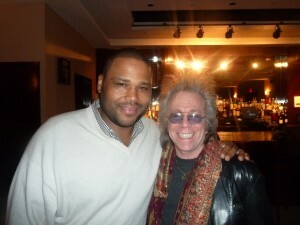 Anthony Anderson and Jeffrey laughing it up after the show. Mark Viera opened the show and killed it as he always does. He had just come back from the Middle East entertaining our troops in 140 degree weather, so when he hit the 92 degree weather of LA, he was freezing. 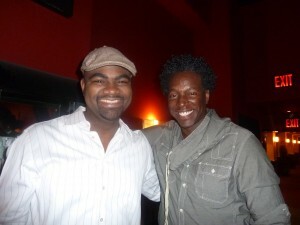 Greer Barnes did a great set, and is another performer who can do really cool sound effects on the mike. He did an impression of a cop on horseback arresting a “brother”, and wondering where he would put him. Does he just say “ Hop on!”? Funny visual of a perp holding onto the cop around the waist as they gallop off into the sunset! In the musical segment of the show they had Naughty By Nature do a set, and the great Chubb Rock was in the audience. Gotham had an All-Star show which was aptly named. Rich Vos was the MC, and he often talks about his sobriety. He’s coming up on almost as many years of sobriety as Bill Wilson. Rich is another of those reliable acts that you can always count on to destroy the room. Bonnie McFarlane was also on the show and to me is one of the funniest women on the scene today. And then there was a guy I hadn’t seen before, which was an unusual and alarming experience for me, and his name was Louis Katz. I’m pretty sure his name is STILL Louis Katz since he has a half hour special coming up on Comedy Central on March 11th, and it would hardly make sense for him to have changed his name before it airs. 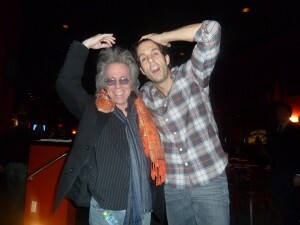 Then I got to attend Rachel Feinstein’s CD taping for an album for Comedy Central to be released later this year,. The evening was hosted by Hot 97 morning star Cipha Sounds who I believe is back to hosting a regular show at Carolines on Tuesdays. Rachel Feinstein throwing down gang signs , to Cipha Sounds from The Bronx, who actually understands them! He describes himself as a Puerto Rican from The Bronx, named Luis Diaz, who can’t speak Spanish. He had a guy from the audience re-introduce him cause he said the audience was all white people who didn’t know him, and he didn’t get enough love. He certainly got it the second time around. Cipha is a funny dude, and I gotta get over to Carolines to check out his show. The great Jon Fisch had advice for anyone guy losing his hair. As soon as you realize you’re losing your hair, turn to whatever girl you’re with and propose! Rachel Feinstein is cool. I don’t know how she was in high school, but she’s definitely cool now! She’s an original, and always fun to watch. She has the unique ability to imitate a guy’s voice and have it sound like a guy’s voice. Most girls can’t do that. Rachel imitates street guys coming on to her with pseudo compliments, opening with “ I’m sayin’ boo!” which might sound to an older person like you might be trying to scare someone, unless you are immersed in hip-hop culture. And then there was Pete Correale’s sold out show. Jon Fisch was MC’ing cause good comics know other good comics! Also on the bill was Veronica Mosey another fave of mine. She’s also one of the few women I see who can really command a stage, and take control of the audience. It’s all about energy and she puts it out there! Pete is funny and clever, and makes any topic work. Like his “Killer Whale” bit, about the whale killing it’s trainer. How couldn’t she know when the word “Killer” is part of his name? He asks, “ How many animals DIDN’T get the name killer? He didn’t get the name from being sharply dressed! Killing is part of his name. Pete Correale asking Jeffrey to flatten his hair and that’s as close as it got. Then he did a bit I guessed was new, and it worked so well I was excited for him. He said during Prohibition, the only way guys had to get high was spinning around. If he had ended it at that, it might have gotten a chuckle, but he embellished upon it, and as he spun himself around it became hysterical. As a comedy writer I always appreciate what it takes to develop a bit to it’s fullest potential. A month from now I’m sure it’ll be even richer. Pete and I had a laugh about the time he and Jim Breuer, and Greg Charles from Carolines played a practical joke on me on the air. 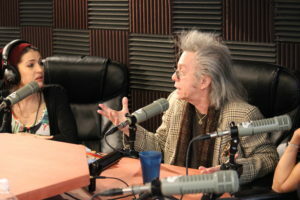 I went on Breuer’s show to talk about my celeb joke book, “Filthy, Funny, and Totally Offensive”, based on my years of writing for the Friars Roasts, and all three of them were in the book. I turned white, and almost had a heart attack, sputtering, “ but you TOLD me I could use those jokes.” Finally Breuer blurted out, “ we’re just effin’ with you.”, but they didn’t do it right away, and it felt like it went on for hours. They had prepared their audience in advance and said, “ Wait till you see what we do to this guy!” I was wondering why they didn’t let me listen to the show before I went on, as guests usually do. I was put into an isolated room to wait for my turn to go on. Greg told me later that they only did it because they love me. I’m like, “try not to love me so much in the future” ! Judy Carter is a one woman comedy industry. She’s a comic, a coach, a comedy writer, an author, a speaker, and she has sets of DVD’s that you can purchase if you’re not lucky enough to live near her in Cali. 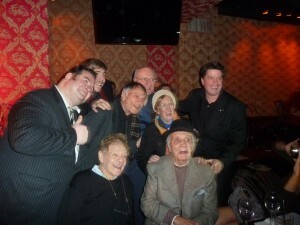 Comic Bob Greenberg made a surprise 88th birthday party for Larry Storch at Gabe Waldman’s Stand-Up New York, and it was a really fun event. Larry was so surprised he actually screamed when he walked into the room. I was afraid for his heart. I ran into my old, old friend Rhonda Hansome who is back performing again, and the great Jerry Stiller got up and said a few words. Even the legendary boxer Jake LaMotta came out to honor Larry. (L-R) 2nd row-Bob Greenberg, Larry Storch, and Dave Konig on the end and in the first row, Jerry Stiller and Jake Lamotta for Larry’s surprise party. Joey Reynolds has a new TV show called All Night With Joey Reynolds. After so many years of doing a hit show on WOR talk radio, which I was honored to be on so many, many times, Joey got his own TV show on NBC New York Nonstop. It’s shot in the ground floor studio in the NASDAQ building right on Broadway in the heart of Times Square, and you can see the show going on from the street. It’s very exciting and I was really happy to be asked to do the show. Not only did I get a chance to talk about my comedy projects but I got a chance to talk about my cure for stuttering which I used to cure myself. I was a pretty severe stutterer. Joey always asks me about it because he finds it fascinating, and I am very grateful to get that information out to people who need it. Stuttering can be cured. And now with the popularity of The King’s Speech, there’s a lot of attention being given to stuttering. 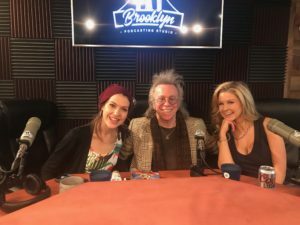 I was on the show with the super-talented Steven Scott, NY1 film critic Neil Rosen, innovative school principal Anthony Albano, ( brother of the late Captain Lou! ), and a few others. 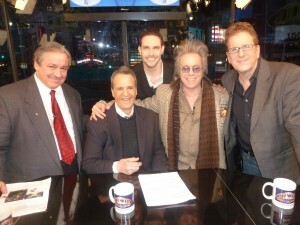 (L-R_ Anthony Albano, Joey Reynolds, Steven Scott, Jeffrey, Neil Rosen on the set of All Night With Joey Reynolds. Steven imitates not only people, but musical instruments so well that he played along with the band, using only his mouth. Sounds like a graduate of The Academy of Oral Skills!!! 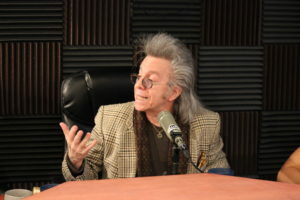 The show is Monday to Friday from midnight till 2 A.M. The Writer’s Guild Awards is always one of my favorite things to cover because Sherry Goldman is a pro and makes sure everything runs smoothly. I take my position at the end of the red carpet cause I can’t stand being squeezed into places, and I greet the celebs as they leave the carpet. It’s so much more comfortable that way. Hosted by Kristen Schaal, it took place in the gorgeous lobby of the Equitable building, and I got to meet and interview so many cool people, including director John Waters, Jenny Lumet, Liz Brixius who created Nurse Jackie, Matthew Settle from Gossip Girl, Wayne Federman who wrote for the event, and Vincent Piazza who plays Lucky Luciano on HBO’s Boardwalk Empire, who said he really liked my scarf. 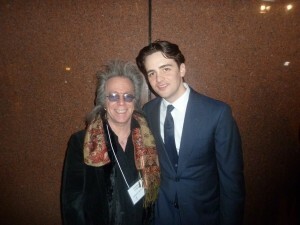 Jeffrey and his magical scarf, with Vincent Piazza at the WGA Awards in Manhattan. It just so happens I often wear 3 scarves at the same time, but that’s a whole other story. I’m a big fan of Kristen’s and I tried e-mailing her to arrange a quick photo shoot, but maybe her e-mail changed cause I didn’t hear back from her. I also ran into the ubiquitous Judah Friedlander who’s at as many places as I am. People often say to me, “ I see you everywhere” and I assure them that I’ll probably be in their apartment when they get home. One very gullible girl once said “ Really?” I assured her that I would! But most important, I found my Comedy Matters Girl of the Month there. Her name is Angela Phillips and she is spectacular. You’ll be seeing her in an upcoming film by Alonzo Anderson, called Step Sisters. She’s a 5’3” ex-basketball player, who became a successful petite model, and actress and is the nicest person you could ever meet. 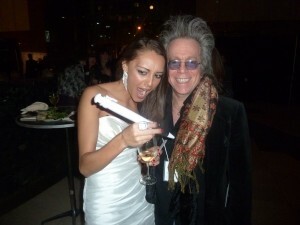 Comedy Matters Girl of the Month, Angela Phillips absolutely shocked at the size of Jeffrey’s pen! She’s the regional director for Bella Petite Magazine, which caters to the petite modeling business. She’s also very humble, and the kind of person that when you meet them, you feel like you’ve known them forever. She has aspirations in comedy, and I’m looking forward to working with Angela on an upcoming project myself! Trust me, … you’ll be seeing a lot of Angela Phillips! Madison Malloy and Andrew Schwartztol are running a new comedy show on Wednesdays at O’Casey’s on West 41st Street. It’s a great room and when I stopped by, one comic was late so I filled in and did a set. That was fun! 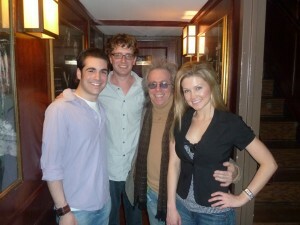 (L-R) Harrison Greenbaum, Andrew Schwartztol, Jeffrey Gurian, and Madison Malloy at O’Casey’s. Jordan Ferber also has a great show and I went by to celebrate with him at the 2 year anniversary of his Thursday night show at Zinc Bar. Another “must see”! They used to call James Brown the hardest working man in show biz. 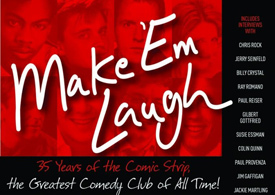 That title has now been taken by Dennis Gatti the one man show who runs the Times Square Comedy Club. When he’s not booking the shows you can find him behind the bar serving drinks. If he could, he’d take every table’s order, and even eat the food, and laugh at the jokes for you. There are five showrooms of different size capacities, and Dennis runs from room to room making sure that everything is going as it should. He also has specialty shows like Manhattan Magic and the Ultimate Drag Off. 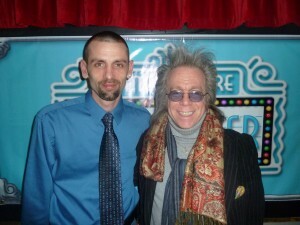 Dennis Gatti and Jeffrey at the Times Square Comedy Club. As if that wasn’t enough, he also manages talent, and the night I was there I had the pleasant surprise of seeing a great talent he’s working with, Bobby Johnson. People often say I know everyone in comedy, but every so often someone escapes my radar. 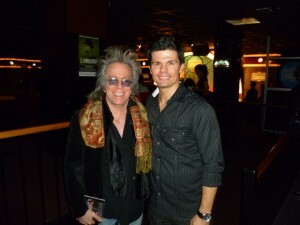 Bobby has a multi-cultural background, and has done lots of TV and has been a regular on 98.7 Kiss FM’s morning show. This guy made me laugh out loud and that’s hard to do. In comedy nobody laughs. They’re like, “ That’s funny”, but they don’t crack a smile. Bobby really made me laugh out loud. His accents are great. His Latino accent rules, especially when he explains how all they want to do is dance, … even at a funeral. “Let’s dance!” But when he talked about how he hoped Arabs have to do the same thing in their airports as we have to do in ours, and mimed a guy unwrapping an Arab going through security, as if he was swathed in bandages, I totally lost it. Bobby Johnson and Jeffrey at the Times Square Arts Center. Nick Kroll is a fixture on TV, and on the comedy circuit in general. You gotta love Nick Kroll. He’s written for Chapelle’s Show and Human Giant, performed at UCB on both coasts, on NBC’s Parks and Recreation, HBO’s The Life and Times of Tim, and is one half of the “Oh Hello” guys with his writing partner John Mulaney. Nick creates memorable characters, like Fabrice Fabrice, craft services coordinator for the show “That’s So Raven”, El Chupacabre, and his newest character Bobby Bottleservice, plus he just aired his first Comedy Central special Thank You Very Cool! Just before it aired I went to see Nick at a store down in Soho called The Hundreds, where he was doing a personal appearance. I also went to give Nick the script I wrote for The Key of Awesome comedy hoping he could star in it with Lauren Francesca. Fortunately he liked it, unfortunately he was on his way to Vegas and then back to LA. Bobby Bottleservice and Jeffrey at The Hundreds. However he did give me a signed Bobby Bottleservice poster on which he wrote, “To Jeff, U R the only person with better hair than me!” Bobby B. , and he gave me a Bobby Bottleservice T-shirt which was also very cool. What he gave me that I liked best was his friendship! Thank you, very cool! Anyway, until next time, … remember, … Comedy Matters!! !